What The… Somehow Liberal Media Smears Mitt Romney With Death of Cecil The Lion? For the last few days the left-wing media has been losing its tiny collective mind over the death of Zimbabwe’s Cecil the lion. Well, today the liberal Washington-based political newspaper The Hill published a story breathlessly noting that the man who shot the lion donated to Mitt Romney’s presidential campaign. And then in a perfect example of media bias the newspaper Tweeted a photo of the dead lion next to an image of Romney! This is little else but the yellowest of yellow journalism. What does Romney have to do with the death of Cecil the lion? Nothing. 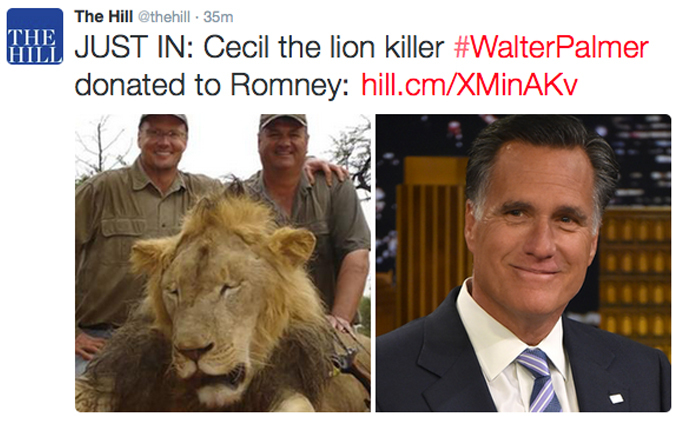 But The Hill wants to link the death of the beloved lion to Romney! In the story The Hill traced the political donations of the hunter who killed Cecil as if his giving money to a few Republicans was somehow consequential information that enhances the story driving the left to lament over the death of this lion. So, where are the stories about murderer Cecile Richards of Planned Parenthood donating to Obama and Hillary? I think if I were a politician I’d rather have a hunter’s donations than the donations of a woman who is personally responsible for the murders of millions of minority babies! Still, the political donations of this hunter have no part in this story. It is a meaningless factoid that has no bearing on the tale. This The Hill story is not news. It is little else but an attempt boost liberal politics.